Wait! Before you jump on the ‘inappropriate’ bandwagon, while we loved the American Pie movies, it’s not that kind of MILFS we’re looking for. We need Motivated Individuals Looking For Shifts. MILFS. See? Here at the Low Cost Parcels head office in North Shields, we need awesome marketing and customer service assistants to help our team run like a dream. The shifts we’re looking to fill involve a flexible working approach and would be ideally suited to someone hoping to work around, for example, a school run. The Low Cost Parcels office isn’t your normal working environment. No. We love quirky. We love different. That’s why we built a pub in the office. We play pool on our orange pool table during our breaks. We provide free soup to our employees at our LCP soup kitchen. And we love flexible. 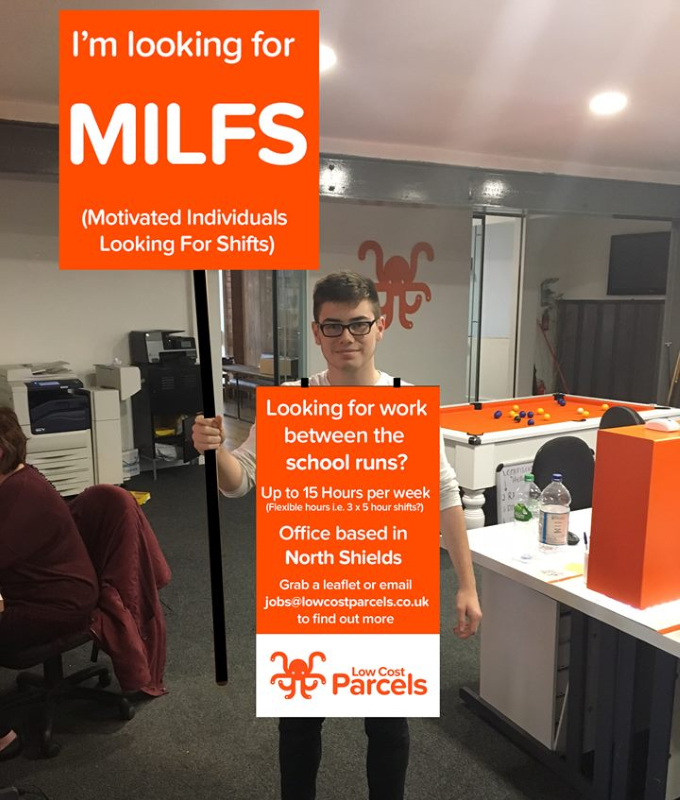 We’re looking for dynamic, outgoing, confident candidates to fill two roles here at Low Cost Parcels’ Head Office in North Shields. The first position to be filled is customer services assistant. Know how to answer a phone? Of course you do. But can you hold your own in the face of enquiries and provide amazing customer service to our growing base of customers? Yes? Then this could be the role for you. Or how about becoming a market research assistant? Do you love making phone calls and chatting with potential customers about their parcel needs? OK, so maybe that isn’t something you do on a daily basis at the moment. But it could be. Would you like to do it for us and get paid into the bargain? Help us to find potential customers out in the big wide world for our regional partners to chase down and bring aboard the LCP ship. These are the roles we’re looking to fill. Do they sound good to you? Well here’s a little more information. Be able to handle a computer. You know, at least basic IT skills. Know your mouse from your keyboard and your dongle from your USB. Be willing to work between one and five 5 hour shifts per week (between 10am-3pm) and fit in to our awesome customer service team. Have a great deal of craic, a good sense of humour and a willingness to go the extra mile to help our customers out, every time. Why not drop us a line? Email your CV to jobs@lowcostparcels.co.uk and we'll be in touch.